Remove corn from cob. Place kernels into boiling water and add Old El Paso™ Taco Seasoning. Let boil for about 5-6 minutes then remove and drain. Put corn into a medium sized bowl. In a small bowl whisk together lime juice, oil, and vinegar. Pour into corn. Add peppers and onion and toss. Add cilantro. Let sit in fridge for at least 4 hours. Overnight is best to get all the flavors going. 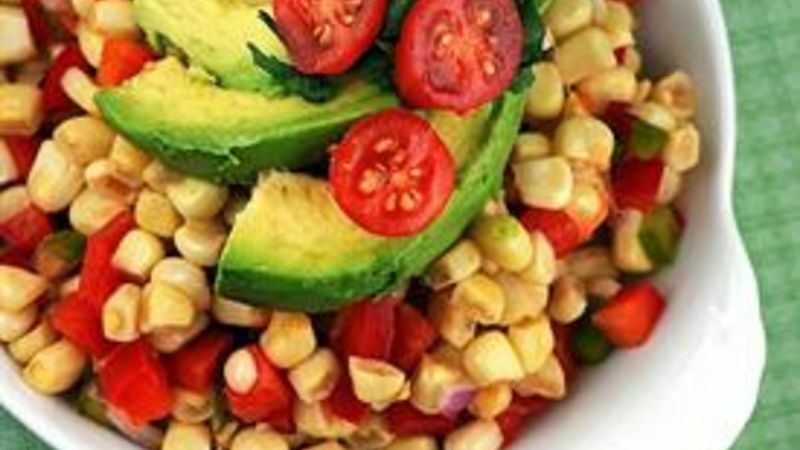 Serve with cherry tomatoes and avocado slices. Summer and corn on the cob go hand and hand. I can’t think of a single childhood backyard BBQ that didn’t have corn. And I remember really well since I was the one sent out with the large bag of corn and a paper bag to shuck it. Shucking corn is quite a pain, but you must admit that it’s totally worth the effort. Sweet corn is so versatile from just plain old corn on the cob, sweet corn ice cream (which sounds weird but is amazing! ), corn pudding, creamed corn, corn chowder, to this Mexi-Corn Relish I made to go with almost any grilled meat. It’s a nice, flavorful and vibrant side that will brighten up any party food table. One of the best tricks I was ever taught for cutting corn was to do it over a Bundt pan. It works really well. Sure, you’ll still get a flying stray corn kernel now and again, but overall it helps keep the corn in one place and has a great holder for the corncob. One of the things that makes this corn recipe different is I actually boil the corn in Old El Paso Taco Seasoning so that the flavor (much like a crab boil) gets infused into the corn. Optional, but if you like a little heat just chop up some jalapeno and add it…I’m kind of a wimp, so I kept the flavor for mine nice and easy with the red and green peppers. Peabody loves ice hockey (she plays!) and all things baking! Check out her great stuff at her blog site Culinary Concoctions by Peabody and her Tablespoon profile. Keep an eye out for what she can do with party food!